Brendan Dawes' new art project recreates fictional passengers' iconic boarding passes, just in time for Christmas. The latest art project from the ever-inspiring Brendan Dawes is something a bit different from most poster designs, and a must-have for anyone obsessed with the minutiae of cinema. 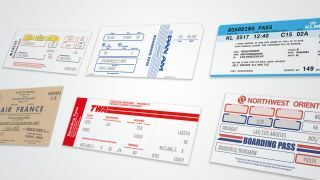 His new work, entitled Now Boarding, is a set of prints that recreate the boarding passes for momentous flights undertaken by characters in some of the biggest films from the last 75 years. Dawes' prints are large-scale, period-perfect facsimiles of airline boarding passes; look closely and you'll be able to work out which movie they refer to. Our favourite, naturally, is a TWA boarding pass for a Mr J. McClane, for his flight from New York to Los Angeles on 24 December; a reference to probably the greatest Christmas film of all time, Die Hard. We also love Vincent Vega's KLM pass for his return flight from Amsterdam to Los Angeles, after his four-year European trip where he discovered that you could get beer in cinemas and that the French call a Cheese Quarter Pounder a Royale with Cheese; one for the Pulp Fiction fans. The other films referenced in the set are Beverly Hills Cop (Axel Foley's flight from Detroit to LA), The French Connection (Popeye Doyle's trip from New York to Marseilles), The Graduate (Benjamin Braddock's Boston-LA flight) and Casablanca (a fabulously retro Air France pass for Lisa Lund's climactic flight to Lisbon). Each boarding pass is a pigment print on 100 per cent cotton rag paper, and is from a limited edition run of just 50 prints, with each one signed and numbered. The prints will cost you £240 unframed, or £350 framed, but there's also a run of 25 complete sets that can be your £600 unframed or £750 framed. You can order online here, or buy them at the Richard Goodall gallery in Manchester.